Patients bore the brunt as nearly eight lakh chemist shops in the country were shut on Wednesday in a nationwide strike by the All India Organization of Chemists and Druggists (AIOCD) to protest against the online sale of drugs. “Over 90 percent of chemist shops were shut. The only reason we allowed 10 percent to remain open was to avoid any difficulty to patients. All our retail chemists have joined the strike of over 800,000 chemists in states and union territories, making it a total success,” J.S. Shinde, president, AIOCD, told IANS. The loss from the day’s strike is estimated to total hundreds of crores of rupees. The association warned of an indefinite strike if the government failed to address the issue within a week and ban online sale of medicines. Only a few shops, mostly run by government agencies, were open at some places on Wednesday. Shinde said the association tried to talk to the health ministry over the illegitimate sale of medicines by e-pharmacy companies, which was hindering the pharmacy outlets. “We also want to prevent the sale of duplicate medicines being sold by e-pharmacy companies, which the consumers are not going to understand,” he said. In Maharashtra, around 55,000 retail chemists and pharmacists joined the strike. In Delhi, over 6,800 chemist shops were shut. The main demand of the chemists is a ban on sale of medicines, including dangerous drugs, through online pharmacies on different websites. “I wanted some medicine but all chemist shops were closed,” Balbir Singh, an employee in Chandigarh, told IANS. Patients and their attendants complained they were unable to buy medicines. “The chemists and the government should have sorted out the issue. Why should patients suffer?” asked Monica Sethi, a housewife whose relative was admitted in a hospital in Gurgaon. However, Shinde claimed that the strike was “in public interest since the sale of medicines through internet was illegal, increases the risk of adverse drug reactions, and would ease entry of low quality, unbranded and spurious medicines”. He said online pharmacies were threatening the jobs of nearly eight million people employed by chemists. Online pharmacies supply I-Pills, MTP kits, anti-depressants, cough syrups and so on without confirming the authenticity of the prescriptions or the patients, he said. 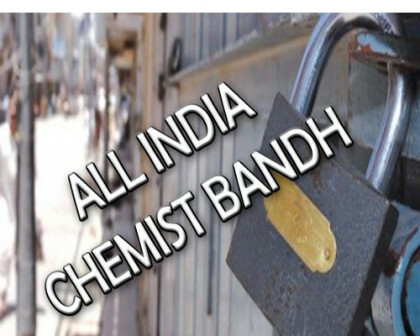 In Madhya Pradesh, over 20,000 chemists’ shops were shut. “The government has no regulation over the online supply of drugs,” Bhopal Chemists Association president Lalit Jain told IANS. Over 25,000 chemist shops in Rajasthan too were shut. “The strike was successful,” Dhanpat Sethia, secretary of the Rajasthan Chemists Association, told IANS. The state government said 350 medicine shops run by the department of cooperatives remained open. But people complained that not all medicines were available, despite long queues. “This strike has troubled patients. It is happening at a time when large number of seasonal diseases like dengue and malaria are being reported,” said a doctor who did not wish to be named. In Kerala, nearly 14,000 chemist shops were closed. So were thousands of chemists across Punjab, Haryana and Chandigarh. More than 5,000 chemists across Himachal Pradesh too joined the. The state civil supplies corporation drug stores, however, operated in major hospitals. But only a handful of medicines, mostly generic, were available in the civil supplies stores, rued Parkash Chand, whose son was admitted to the Indira Gandhi Medical and Hospital in Shimla. Those in online business of medicines said they were doing no wrong. Kulpreet Kaur, co-founder, Shop Pirate, a brand also involved in the sale of medicines online, said: “There is no harm in technology acting as an enabler in offering convenience to customers.